Compost bins: Which type should I buy? 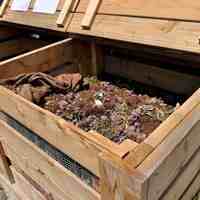 Composting is key to organic gardening. It nourishes plants and the soil food web, acting as a fertilizer and soil amendment. Arguably, it’s the biggest contributor to the health of your organic garden, especially in the long term. You can buy compost by the bag at garden centers, but if your garden is sizable, buying enough to support your garden might drive you to financial ruin. Plus, you never really know the sources of the bagged compost you buy or that from your local municipal facility. Truth be told, you can build a compost bin on the cheap from a stack of bricks or concrete blocks, a plastic garbage can or used shipping pallets. Or you can spend a little or a lot on a compost tumbler or large, stationary bins. You can even spend zero and find an out of the way place in your yard to simply stack your yard waste in a big pile. Anything that gets the job done for you and your garden is fine. If you’re like most gardeners, the biggest determinant of which type of compost bin you need is how much compost you use in a season. If you’re like me and the answer is as much as I can make but I can’t make it fast enough, then save your shekles for the biggest bin you can find (I built a homemade compost bin from shipping pallets years ago it’s – 4x4x4, and it still doesn’t generate enough compost for me). The second determinant is how large a bin can you physically handle? If you have mobility or strength issues, a tumbler may be out of the question and you might want to go with a stationary bin. If it’s a stationary bin, you’ll probably want to find a good location in your landscape where it can be out of sight yet still catch enough rain and heat to cook the compost and keep it moist. But a stationary bin can also be challenging, as you’ll have to give it a stir once in awhile. Note: You won’t see much agreement on the terminology for types of compost bins online. Sometimes they’re just “bins” and “tumblers”. Sometimes broken down into 6 categories. I’ve broken down the types here in the simplest terms: tumblers, stationary bins like those made from plastic, and movable bins, like those made from wire. One could also argue that stationary bins also include large bins made from salvahed materials, which they are. If you make large amounts of compost, a stationary bin (or 2) is usually your best bet. This may be a plastic or cedar bin with or without a lid. The lid serves 2 purposes: to seal in moisture and heat and to deter curious mammals chasing fresh kitchen scraps. Stationary bins are sometimes also called continuous composters, as yard waste and food scraps can be added at any time as the pile breaks down. Compost is created slowly in a continuous bin and generally falls to the bottom where it can be scooped out every few months and filtered from the larger debris. Many stationary compost bins have a tray or hatch at the bottom which makes removing finished compost easy. Read the post: Compost: Today’s leftovers, tomorrow’s plant food. A batch composter or tumbler compost bin is a faster way of making compost, although smaller batches are made at one time than with the continuous bins. A tumbler, which is round or cylindrical, must be stirred or rolled once a day to mix the ingredients and moisture must remain consistent. The initial compost ingredients must be balanced when starting compost in a tumbler – a proper mix of greens and browns – but compost is created in as little as 4 weeks, faster than with a stationary bin. Buyer beware: Tumblers are great, but closely inspect the stand or base supplied with the tumbler. Is it rugged enough to support repeated, heavy, fresh loads of compost and stand up to years of abuse from weather? Open style, movable compost bins like wire bins are inexpensive (preferred for making leaf mold). These can be bought commercially or you can fashion one yourself from hardware cloth or similar rugged, flexible metal mesh. Wire compost bins are frequently set up in a series: The first to hold fresh yard waste, the second to hold composting materials as they break down and the 3rd to hold finished compost. There is considerable overlap in terminology regarding movable compost bins – many of the plastic bins mentioned above are certainly movable (unlike a bin made from shipping pallets or concrete block). Thank you to the BigBlogofGardening.com for the original article here.